Powers/Abilities: Merlyn described Mandrac as having the power of a god. 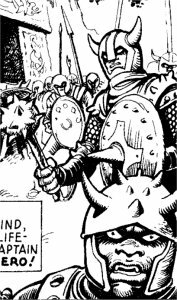 He certainly possessed superhuman strength to an unspecified degree - his giant minions were stronger than similarly sized humans would have been, but it took two of them to carry Mandrac's war hammer, a device he then wielded with a single hand. This war hammer's blows could create chasms which rent the ground asunder. Mandrac was able to create carrion crows out of thin air, apparently giving his dark thoughts form. These crows could fly and assume human shape. He could sense when they were injured, hearing their pleas for help wherever they were, and calling them home to be re-absorbed. He could also sense living beings who followed him. He was served by a variety of minions, from his gigantic warriors, to his "children" Nightshade and Wolfsbane, to the demonic skeleton White Rider. Either he or his fellow Nethergods were able to return the spirit of Mordred the Evil to physical form. History: (Hulk Comic 23/2 (fb) - BTS) - Since time immemorial the Nethergod Mandrac commanded the souls of the dead who died in Otherworld or on its borders. (MSH#17) - Mandrac and the other Nethergods (presumably Necromon, and at least one other) gave the spirit of Mordred the Evil the power to walk once more amongst men. (Hulk Comic#41/2 (fb)) - When Mordred's agent le Sabre was defeated by the Black Knight, Mandrac and his fellows appeared in a vision before Mordred, chastising him for his failure, and questioned whether they had been right to grant him a return to physical form. Mordred insisted that they had not made a mistake, and vowed that the Black Knight would not survive a second time. 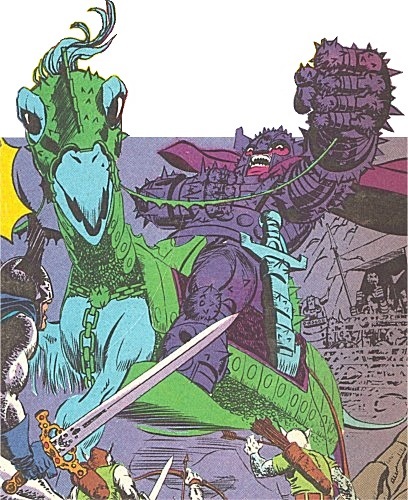 (Hulk Comic#20/2, 21/2 - BTS) - Mandrac sent his agent, the White Rider, to slay Captain Britain when he tried to pass through the Gates of Otherworld. Though the Rider was successful, it was also destroyed by the hero's ally, the Black Knight. (Hulk Comic#22/2) - The Black Knight and his elven companions stood by the body of their fallen comrade. The elves noted that they were on the threshold of Otherworld, that Merlyn awaited within, and that he had instructed them to bring Captain Britain to him. The Knight wondered aloud if Merlyn, though master of many things, could hold sway over death itself? In response a loud voice boomed out "He cannot!" as Mandrac, Lord of the Slain, rode through the gates of Otherworld, followed by a horde of minions. Mandrac proclaimed that the White Rider had claimed the body of the Knight's comrade, and now he would claim the soul. Then Mandrac turned his steed around and marched back through the gates, followed by his warriors, who carried away with them the corpse of Captain Britain. (Hulk Comic#23/2) - As Mandrac and his forces conveyed the dead hero's form towards the Netherworld, Mandrac sensed "a shadow at my heels...as if some mortal man had dared to follow my steps." With a thought the Nethergod created two huge carrion crows, and sent them to find and destroy those who pursued him. Moments later the dark lord sensed that someone was resisting his avian minions, much to his amazement, as his power had never been challenged before. 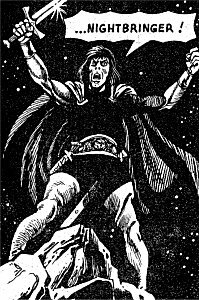 Even as he said this, a fiery glow appeared in the sky, and a voice boomed forward, stating that while in the land of the dead Mandrac was truly sovereign, here in Otherworld he must obey another's will. Angered, Mandrac demanded to know who challenged the rule of the Nethergods. The blazing light resolved into the visage of a bearded man, who proclaimed that Merlyn dared to challenge, and that Otherworld was his realm! (Hulk Comic#24/2) - Mandrac and Merlyn continued their verbal sparring, but then the Nethergod heard the pleas for help coming from his children, who had been vanquished by the Black Knight and his allies. Mandrac called them home before they could be slain, reabsorbing them into his being. Mandrac then demanded to know if the magician was prepared to face him in the flesh. "Our servants have fought...'tis time that we two met in battle!" Merlyn materialised before him, seemingly a frail and elderly man, causing Mandrac to scoff. The dread lord called for two of his minions to bring forward his war hammer, which he then struck against a boulder, splitting the very ground asunder. The chasm created was so large it nearly engulfed the pursuing Knight and his companions, some distance away, and it knocked Merlyn off his feet. As the mage struggled back up, Mandrac charged him, readying his war hammer for another blow. (Hulk Comic #25/2) Mandrac taunted his opponent as he bore down on him, but Merlyn did not flinch even as the hammer struck at his skull, smiting his head from his shoulders. However, as Mandrac pulled his steed to a halt, he glanced back and realised he had been tricked. What he had believed to be his enemy was merely a rock ensorcelled to deceive him. The real Merlyn rose from behind a nearby stony outcrop, and hurled a ball of energy, which exploded against the Nethergod's helm. Mandrac fell from his mount, declaring that the wizard had seared his eyes. Blinded, the enraged god began flailing wildly, causing his own warriors to flee lest they be crushed by mistake in his anger. Mandrac struck repeatedly at the ground around him trying to kill his opponent, little realising until it was too late that he was opening a chasm beneath his own feet. As the dread lord tottered astride the abyss, Merlyn prodded Mandrac with his staff, and the Nethergod tumbled down. One gauntleted hand grasped desperately at the edge of the crack, as Mandrac began to be engulfed by the flames of the pit, but Merlyn incanted a spell, sealing the rent, and trapping Mandrac within. The Black Knight, witnessing this, asked Merlyn if it was possible that the Lord of the Slain could himself be slain. Merlyn replied that none but another god could slay a god; however Mandrac would remain entombed, held fast by the powers of Otherworld, until the spell holding him was broken. Comments: Created by Parkhouse, Stokes and Neary. 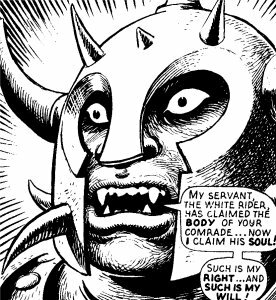 Mandrac describes himself as a Nethergod, the cover of Hulk Comic#21 calls him a demi-god, but Captain Britain (admittedly not an expert) describes the power behind the White Rider as "demonic". I guess the most likely explanation is that Mandrac and his fellows were once gods, but have slipped into being demons as time has passed. The "demi" bit might mean he has some human ancestry, or simply denote his standing in the pantheon of Nethergods. Further to the this, Mandrac is described as "the most feared of the dreaded Nethergods". Merlyn states that "in the Netherworld you reign supreme" (though he also mentions "the dark powers you serve"). Quite how this places him in the Netherworld hierarchy in relation to Necromon I'm not sure, but the first two comments don't imply a subservient position - perhaps he is Pluto to Necromon's Zeus? Or did he rule and Necromon was his servant, until Merlyn imprisoned him? 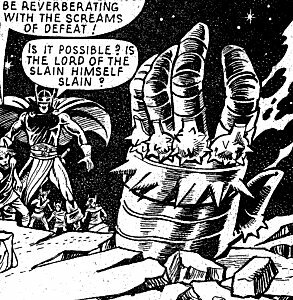 Mandrac and the Nethergod's appearance in MSH#17, bringing Mordred back to life, was shown in Hulk Comic#41, confirming Mandrac and co. as the previously unidentified Nethergods. I've put his appearance in HC#41 as a flashback, though to be accurate, the entire story in that issue is a flashback to the origins of the Black Knight. Mandrac is presumably trapped beneath the surface of Otherworld to this day. His power supposedly on a par with that of a god, and by Merlyn's admission far greater than the mage's own, surely there is a story just begging to be told when he finally breaks free. A horse-like creature with beaked mouth, large eyes and taloned feet not unlike a bird of prey's. It is described at one point as his "phantom charger". After Mandrac was blinded and fell from its back, its subsequent fate is unknown. I guess it probably rode off, though this isn't a certainty. 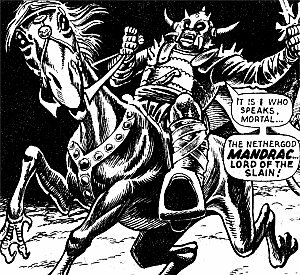 Bizarrely, even though the picture above clearly shows it has bird-like feet, when it charges Merlyn later in the story, the Black Knight declares he can hear the pounding of giant hooves, and the text describes how the steed pulverised the rock "beneath its iron feet". I guess the talons were metallic. They looked much like their master, and may have belonged to the same race of beings. A number of them accompanied him through the gates of Otherworld to retrieve the corpse of Captain Britain. After taking the body, two remained behind to stop Black Knight or his elven allies from following Mandrac. These unnamed guards informed the Knight that his weapons were powerless against them, which seemed to be no idle boast, as even armed with Excalibur itself the hero seemed barely a match for them. The Knight managed to distract them long enough for the elves to pass into Otherworld, then raced past them on his steed Valinor. As the gates to Otherworld slammed shut behind the Knight, the two guards bewailed their fate, claiming they were now "trapped in this alien land". The warriors were armed with a variety of melee weapons, such as spiked maces and spears. Two of them carried Mandrac's heavy war hammer for their dread master, except when he was actually using it.When Mandrac was blinded and fell from his mount, he began swinging the war hammer wildly, and his terrified warriors fled rather than be accidentally killed by their enraged master. Though its not confirmed, it's likely that at least some of these troops would have been among the hordes of Necromon's who later attacked Camelot. The "children of Mandrac", he formed them out of his "dark thoughts" when he sensed the Black Knight following him. 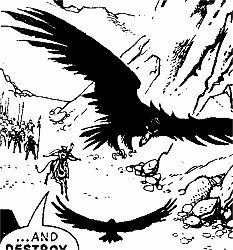 Initially they took the form of carrion crows, large enough for their talons to lift an elf aloft. 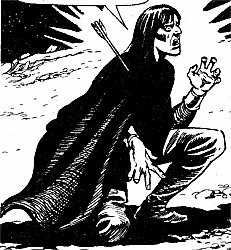 Moondog shot Wolfsbane, who crashed to the ground and transformed into human form, an arrow lodged in his shoulder. Seconds later Nightshade landed nearby and assumed an identical human appearance. He ordered the Knight and his elven companions to submit to Mandrac's will, and when the Knight drew Excalibur in response, Nightshade drew his own blade, Nightbringer, in response, causing the sky to darken. The two began to fight, but simultaneous to Merlyn appearing before Mandrac, the Knight felt himself flooded with energy and gained the upper hand over his opponent. Nightshade tried to ward off the blows from his enemy's blade, but Nightbringer shattered before the onslaught from Excalibur. Wolfsbane, lying wounded nearby with Moondog standing over him with an arrow nocked and ready, sensed this, howled in anguish and declared that the Knight had vanquished them. He cried out to his lord for assistance, and Moondog told him to hold his tongue or take another shaft between the ribs. The order came too late, as Mandrac heard it and called his children home. They instantly transformed back into crows, took to the air, and flew back to him. As they alighted on his helm, they were absorbed back into him.